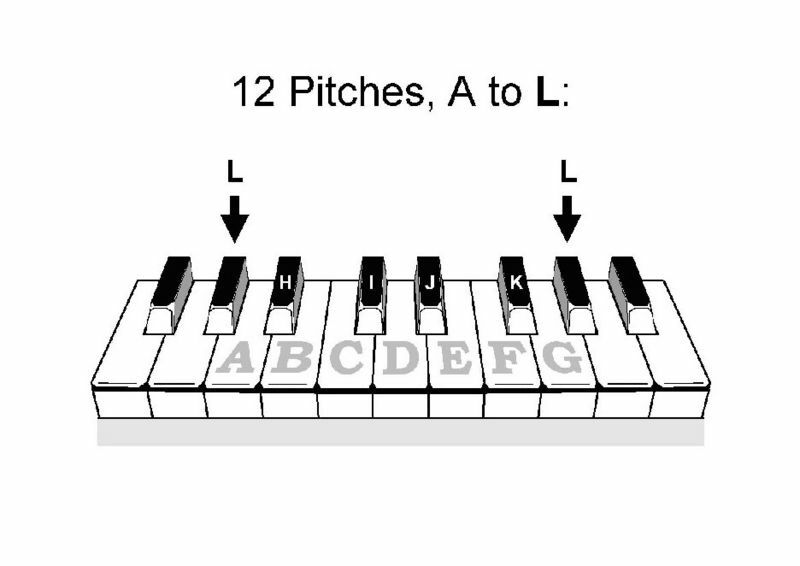 It is useful to sometimes have unique names for the black keys on the piano, instead of always having to refer to them as either sharps or flats. John Keller’s proposal simply uses the next five letters of the alphabet. The TWO BLACK KEYS are I and J, the two dotted letters of the alphabet. They look like two eyes, so the first is named I, and J is its “twin”. A further mnemonic is that in German terminology, B and H are swapped. In traditional notation and terminology, the black keys are called sharps or flats, and related to the lettername of the white key they replace. Thus if the black key K is used in place of the white key F, then the K is called F sharp. We can write this as K = F#. One rule of traditional terminology is that every diatonic scale must use the seven letters A to G in order. One reason for proposing unique letternames for the black keys, is that sometimes we may NOT want to imply which white key is being replaced.